Borough began the day one place above the drop zone but needed victory at Ridge Meadow to confirm their survival. Instead they collapsed in dramatic fashion to lose by 114 runs. And their worst fears were confirmed when their two drop rivals – Havant II and Lymington II – pulled off shock wins to leapfrog above them. Vice-captain Lee Harrop said: ‘It was heartbreaking. ‘We needed to win to stay up but failed spectacularly. ‘After winning the toss, we backed ourselves to bowl them out and collect as many points as we could. ‘On a decent wicket we were quite happy to restrict them to 204 for nine. ‘The bowlers put in a good shift and at tea we felt quite confident. ‘Then Tom Larner and I made a decent start to our innings putting on 53 without loss. ‘We were going along at four or five an over with few problems but then it all went badly wrong. ‘A triple-wicket maiden rocked us back on our heels and from that point on we were in trouble. Henry Glanfield (four for 32) did the damage for the Dons – removing Larner, Harrop and Simon Creal in the same over. Ian Turner then press home their advantage with two for four in 6.1 overs. Harrop said: ‘Our innings sums up our season. We realised early on we might struggle but never thought we would be relegated. ‘We won six games, so it wasn't a total disaster. ‘Our problem was having to make too many changes. ‘I am hopeful we can keep hold of our promising youngsters and bounce back up next season. 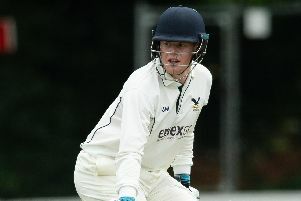 Havant II will join Borough in the Hampshire League despite a six-wicket win against Bashley II at Havant Park. 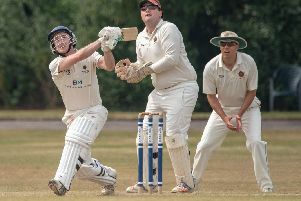 Andrew Gorvin took three for 18 and hit an unbeaten 55 in a match-winning display. But Lymington II’s shock win at leaders Fair Oak saw both Havant II and Gosport Borough relegated.